A colourful mood light ideal for lighting nurseries, playrooms and bedrooms with colourful and exotic LED animals, illuminated sillhouettes that will add a relaxing light to the room! 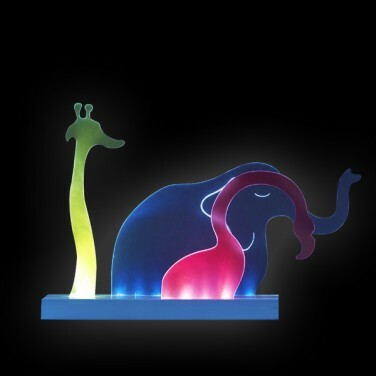 The Zoo Bedside Lamp is an ideal night light for babies and young children, this cute and colourful light shows the silhouette of 3 animals of different colour. This bright mood lamp can be placed as either a wall mounted lamp or a freestanding table lamp. Zoo Bedside lamp Zoo is a charming night light for babies and children, with cute silhouettes of three colourful animals. Zoo Bedside Lamp is completely safe for children to handle with no access to electrical parts that can harm or injure your child. * Colourful and bright lamp with 3 animals. * Ideal as a night light for babies and young children. * Size: 27 x 30 cms (10.6 x 11.8 inches).